India’s May 1998 nuclear decision forms the backdrop to the contributions in this edited volume. 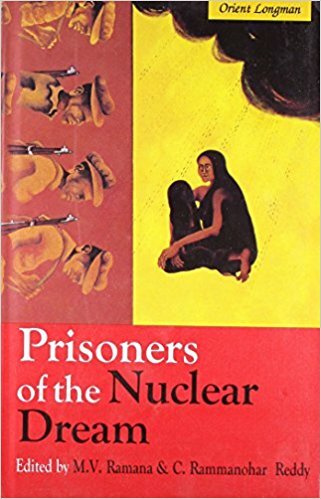 In general, Prisoners of the Nuclear Dream is a critique of the nuclear tests, the motives underlying the decision, as well as the immorality, dangers and costs inherent in developing a nuclear arsenal. The critique is in four parts, each focussing on a cluster of issues; and it proceeds as follows. India does not need nuclear weapons against Pakistan and China, neither of which constitutes a threat. There are grave problems and dangers associated with the development and deployment of a full-fledged arsenal. The logic of nuclear deterrence is incoherent, illegal and immoral, and those who advocate building the bomb are committing treason (against humanity, that is). Weaponization demonstrates a turn towards militarism and its associated ills, including the diversion of much needed resources from developmental activities. Finally, the very pursuit of nuclear technology involves a price in terms of health and environmental pollution, while the actual employment of nuclear weapons would involve the infliction of unimaginable horror and suffering on innocent people. Several components of the above construct are indeed valid. Health hazards, environmental pollution, even catastrophes, diversion of resources, the abhorrent threat to murder inflict life-long suffering on millions of people, the risks involved in nuclear deterrence, are all verities that cannot be denied or overlooked. Yet, these have not proved sufficient to move humanity towards a nuclear weapons free world. The reason for this state of affairs lies in the centrality of ‘power’ in international politics and the pursuit of power by states impelled by fear, profit and prestige (representing the goals of security, prosperity and recognition, respectively). Needless to add, nuclear weapons confer enormous power and it is precisely for this reason that states continue to possess, or seek to acquire them. And contrary to the assumptions of idealists, true peace, friendship and partnership in international politics are a function of asymmetry of power1 or, as in the West European case, a result of absolute exhaustion. During the Cold War years, India’s stand was informed by the moral and legal questions posed by nuclear weapons. And these, as Siddharth Mallavarapu neatly summarizes, influenced the Indian position that even their use in reprisal against a nuclear attack would violate humanitarian law. Further, India also argued that nuclear deterrence is an abhorrent concept and that it would only encourage greater vertical and horizontal proliferation. Hence, the best solution was universal nuclear disarmament. But at the same time, given the reality of expanding and enduring arsenals, New Delhi also insured itself against nuclear intimidation through an informal alliance with Moscow. It, however, took this step only after Lal Bahadur Shastri’s attempt to obtain international nuclear security guarantees against potential Chinese nuclear intimidation failed. Interestingly, this failure came about because of Soviet refusal to participate in a scheme that would antagonize China (a fellow Communist State) as well as due to western fears that negotiations over such an international guarantee would delay the conclusion of the Non-Proliferation Treaty (NPT). Here, we need to remember that it was the fearful shock generated by the Sino-US rapprochement that led to India and the USSR coming together. Professor Amartya Sen is, therefore, not entirely correct in characterizing the Indian reaction to the nuclear order as marked by ‘moral resentment’ alone. Fear is also a key, and it began to assume more worrying proportions during the 1990s consequent to the dissipation of the Soviet/Russian alliance and the perpetuation of the nuclear order through the indefinite extension of the NPT. Moreover, by early 1990, Pakistan had turned that ‘last screw’ by fabricating several nuclear cores, with China widely acknowledged as having played a significant role in the development of its nuclear deterrent. Viewed in this backdrop, the 1998 decision is not a ‘prudential blunder’ but a prudent forearming against potential nuclear intimidation. In the same vein, it does not represent a radical turn towards militarism as implied by Professor Jean Drèze. Nor does it mark the triumph of (what Itty Abraham had earlier fancifully termed as) the ‘strategic enclave’ – a lobby that took a mere 34 years to tempt the Indian political leadership to commit the nuclear sin! Here, one is compelled to add that the title of M. V. Ramana’s chapter (La Trahison Des Clercs) as well as the thrust of Srirupa Roy’s argument (the monumentalist nature of the Indian state and the fetishistic nature of Indian science, which formulations she has adapted from Itty Abraham) simply amount to highfalutin nonsense. But are Indian fears justified? No, according to Professor Kanti Bajpai, who believes that if India were to give up its nuclear option, even so much as reopens talks on Kashmir and other bilateral disputes, and reconfigures its conventional forces to make them non-offensive, “Pakistan would have little choice but to end its weaponisation programme.” India also does not need nuclear weapons against China because bilateral relations are steadily improving, the border dispute is no longer a thorn in the flesh, and anyway the more critical danger lies in conventional deficiency. He also explains away Beijing’s assistance to Pakistan’s nuclear and missile programmes through a “thought experiment”, which focuses on China’s plausible motives to the total exclusion of the actual effects of its ‘benign’ actions on Indian security. And he contends that this thought process constitutes a ‘realist’ view of the world! In cloud-cuckoo-land? What the above passage demonstrates is that proponents and opponents could, and do, arrive at a particular figure to support their arguments. This is clearly demonstrated by Rammanohar Reddy, who, at the end of a rather painstaking effort, concludes that the guesstimate he had arrived at could well be lower than the actual cost! A telling example of guessing is the manner in which he arrives at the cost of assembling a bomb – Rs. 2.5 crore, which is the average between the Rs. 1 and 4 crore estimates proposed by P.K. Iyengar and K. Sundarji, respectively! What is not disputable, however, is the fact that large amounts of money will be spent on the nuclear arsenal as well as on conventional forces. But then, do we have the luxury of debating the pros and cons of ‘defence and development’ in an international political environment dominated by the strategies of conquest, annihilation, attrition and dismemberment? In any event, India and Pakistan have taken irrevocable decisions to weaponize their nuclear capabilities. It is true, as Zia Mian notes, that many constraints are involved in deploying and operationalizing nuclear weapons. But it is likely that both countries will keep their nuclear arsenals in a non-assembled and non-deployed manner for some time to come, a course that both Zia Mian and Ejaz Haider recommend. Be that as it may, India and Pakistan will be forced to traverse the strategically sensitive path earlier trodden by the other nuclear weapon powers as and when they decide to deploy their arsenals. Here, Ejaz Haider’s model for managing the India-Pakistan rivalry, including the several confidence-building measures (CBMs) he has collated, could prove very useful indeed. But at the same time Haider also cautions that CBMs alone cannot successfully manage the rivalry unless the root cause (read Kashmir) is addressed. What he overlooks, however, is the fact that Kashmir is not so much the cause but a symbol of the contrasting and contending conceptions of Indian and Pakistani nationalisms. The possession of nuclear weapons by both countries means that neither can impose a unilateral solution, which renders preservation of the status quo the best possible option. Despite one’s disagreements with several of its ideational strands, the book is a useful addition to the literature, in that it sharpens the nuclear debate. While the idealism underlying its articulations is understandable, the realities of international power politics compel states to make difficult choices. The Manhattan Project was one such choice. Other states have subsequently made, or are even now making, similar choices. But the fact remains that India has been the most reluctant member of the nuclear weapons club. And its entry into this club was impelled by the threats posed by its adversaries as well as by the prevalent international order. Neglecting or ignoring these facts can only lead to the skewed perception that India is mesmerized by the nuclear dream, when in actual fact it is a prisoner of the nuclear dilemma. Reference: 1 For a concise exposition of this dictum with respect to the Anglo-American ‘special relationship’, see Robert Skidelsky, “Imbalance of Power,” Foreign Policy, March/April 2002, pp. 46-55. 2 Susanna Schrafstetter, “Preventing the ‘Smiling Buddha’: British-Indian Nuclear Relations and the Commonwealth Nuclear Force, 1964-68,” The Journal of Strategic Studies, 25 (3) September 2002, pp. 92-94. Kalyanaraman is Associate Fellow at the Institute for Defence Studies and Analyses, New Delhi.